I own a concordance, but it’s packed away in a box somewhere. Useful as a print concordance is, with sites like the NET Bible and Bible Gateway, not to mention various software programs available, I can do any word or phrase searching quickly at a computer. This post will mark the completion of my multiple-part reviews of three major Bible software programs: BibleWorks 9, Accordance 10, and Logos 4. In this final part of my Logos review, I look at the searching features available in Logos. No print concordance necessary. 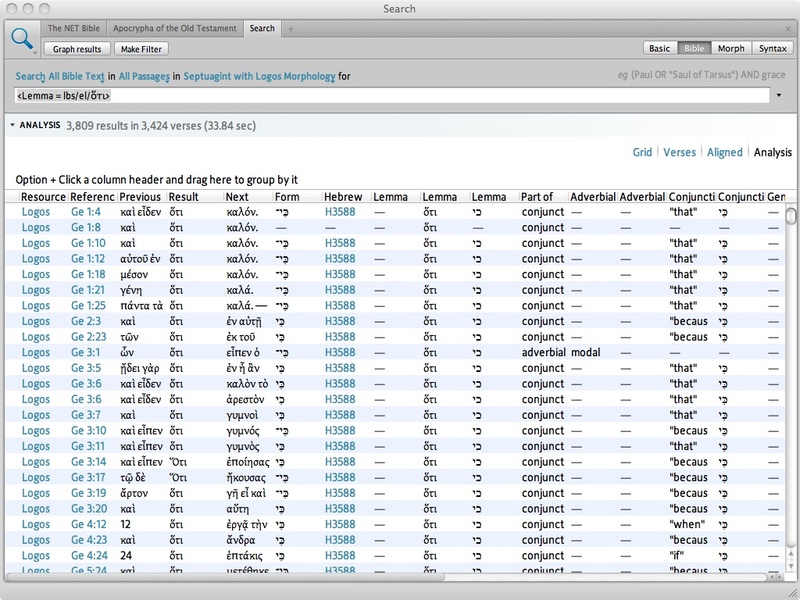 The above highlights four search categories: Basic, Bible, Morph, Syntax. 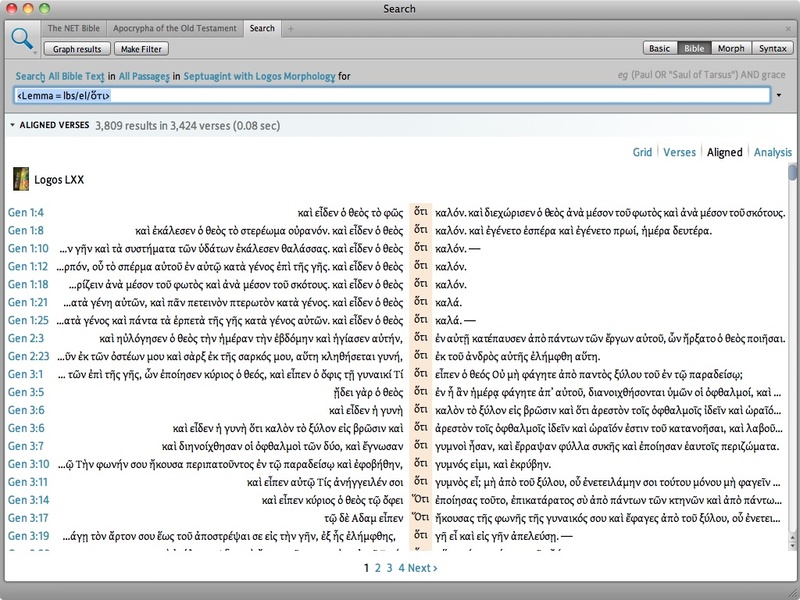 A “Basic” search searches your library; “Bible” is just what it says it is. “Morph” can search according to a word’s inflection. “Syntax” can perform more complex grammatical searches. There are multiple ways to search for and look up things in Logos. There’s a useful instructional video here with more information about how to do a “Basic Search” in Logos, i.e., search every resource in your library. And you can look here to watch a video that explains how to utilize the command bar on the home screen for searches. You can also right click on a word in an open resource and search from where you are, looking it up in that resource, in all open resources, in your whole library, etc. I was pleasantly surprised by the versatile ways one can search in Logos. 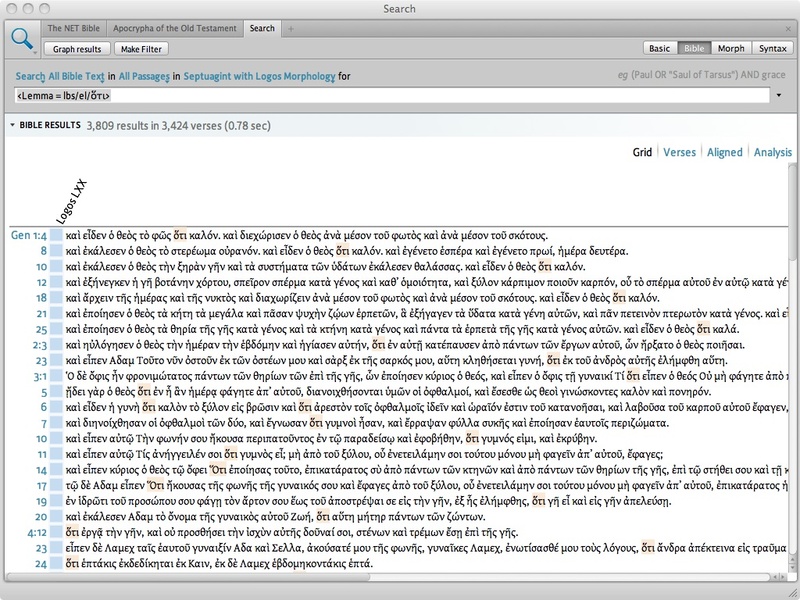 The control+F search function is easy to use and remember–it’s how I search .pdfs and open Web pages already. Nearly five seconds to return search results for a word. 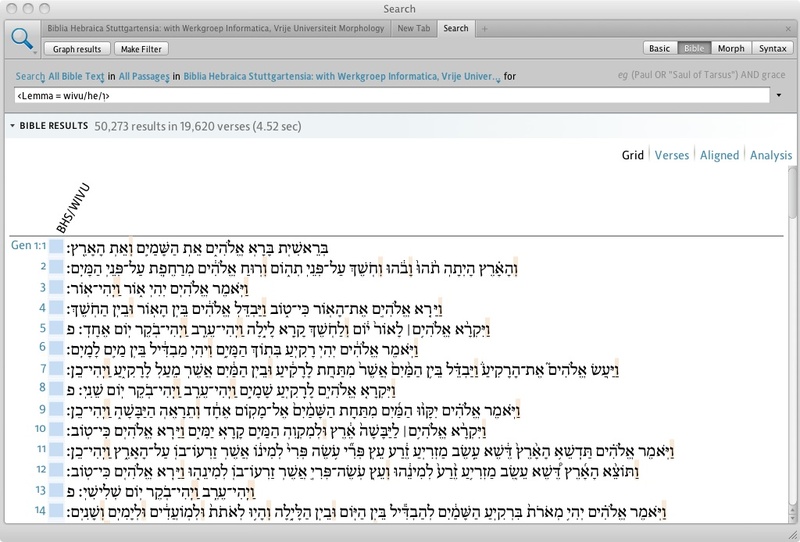 Granted, the above is the most frequently occurring word in the Hebrew Bible, but using different software I’ve been able to perform such a search significantly faster. Lack of speed is perhaps the chief weakness in Logos. Part of this, I think, is because of one of its strengths, which is its massive library. 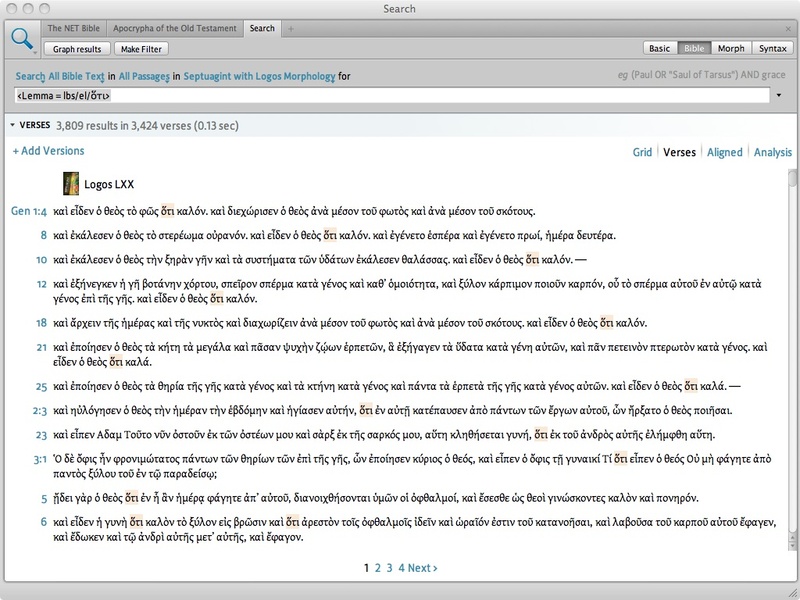 Logos says, “The central metaphor Logos Bible Software is the universal digital library.” While this is a commendable project, and while the resources available in Logos are quite impressive (as I wrote here), it does seem to be at the expense of quickness of searches. Or perhaps it’s not just a library issue; it could be in the coding or some other. Either way I hope future editions of Logos will improve upon search speed. This seems to be a vital need. I’ve had searches that turned up results faster than 5 seconds (a couple in under a second), but I also did a Bible search today that took more than 20 seconds to return results. I have found the “Analysis” sorting the most helpful, since you can click on any of the column headers above and it re-sorts in the same way an Excel spreadsheet would. One other thing to note is that Logos offers a good discount program. For more on Logos, this promotional pdf is a helpful introduction. You can also visit logos.com. Thanks to Logos for the review copy of Logos 4 with the Original Languages Library included. For the review copy I have been giving my honest impressions of the program in a multi-part review (here, here, here, here, and here), which this installment concludes. Look in coming weeks to this blog for a comparison of Logos, BibleWorks, and Accordance. http://www.HolyBibleVerse.com is a neat Holy Bible search engine/tool (also read, listen, compare and/or visualize the Bible verse by verse or chapter by chapter). Some fun stuff thrown in to make Bible study more enjoyable. Thanks, Dave! I’ll check it out.